In the gas metering skid of pipeline, gas compensation equations is used to execute the correction for compressibility and super compressibility and to get compensated flow at normal, standard or reference pressure and temperature. Yokogawa provides controller embedded flow calculation library based on AGA (American Gas Association) reports. 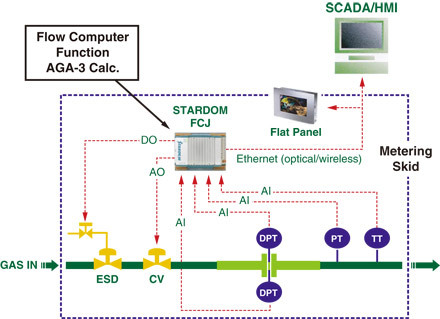 Yokogawa offers the flow calculation for metering solution as an APPF (Application Portfolio) on the STARDOM autonomous controller, FCN/FCJ. 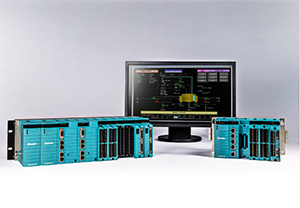 Combining the IEC 61131-3 language with powerful 32-bit processor, Yokogawa will provide flow computer with quick response to I/O and fast calculation result. Furthermore, due to high memory capacity of FCN/FCJ, Meter APPF will store 35 days daily average data (Pressure, Differential Pressure, Temperature, Flow and 2 user defined variables), and the history of the last 70 parameter changes. The Meter APPF calculates the flow accuracy in real time, considering the uncertainty of all measures involved. Data setting regarding Natural Gas composition can be made manually or automatically by online chromatograph connection (MODBUS, OPC, etc). The interface for manual data composition inputs is provided as part of Meter APPF this interface also provides historian and parameters data visualization. AGA3 flow calculations where the orifice plate (Flange taps or Pipe taps) metering of natural gas is required. This portfolio uses pressure, differential pressure, temperature and some parameters as inputs in order to perform the calculation of natural gas flow. AGA7 flow calculations where turbine metering of natural gas is required. This portfolio uses the pulse train from turbine meter and some parameters as inputs in order to perform the calculation of natural gas flow. AGA8 super-compressibility. This portfolio uses pressure, natural gas composition and temperature as inputs in order to perform the calculation of compressibility gas factor. AGACOM makes all interfaces of AGA blocks with physical inputs, making unit conversion and making data consistency. AGAHIST prepares data for recording to flash memory. It will store 35 days daily average data (Pressure, Differential Pressure, Temperature, Flow and 2 user defined variables), and the history of the last 70 parameter changes. AGA solution from YOKOGAWA enables new Gas & Oil application that is cost effective, reliable and good performer.